Do you have a child that is as crazed over Minecraft as much as my girls are? My daughter, Maisy, just turned 8 and absolutely had to have a Minecraft theme to her party. I was thrilled to be able to find these free printable invitations to send out to the guests. 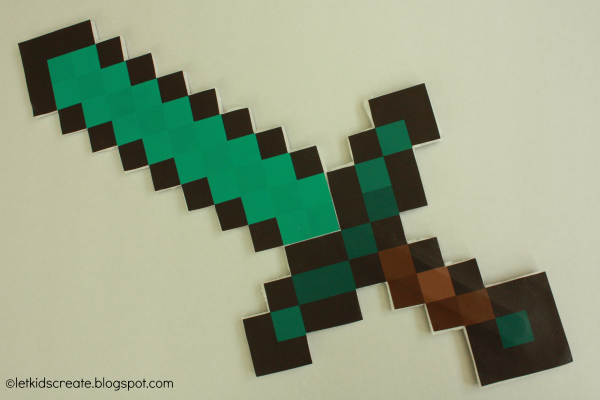 One thing we absolutely had to have was a Minecraft sword to give as party favors to our guests. I found this fabulous printable over at All for the Boys to help us with that. She's got several different versions of the sword ready to print along with easy-to-follow instructions. 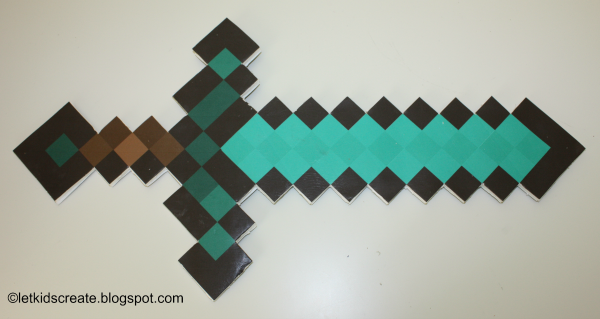 We used Mod Podge to adhere the printables to a foam board and were able to craft 14 of these fun blocky swords for the guests. They were a major hit. One minor adjustment I did make to the sword after making the first 3 for my girls and having them play with them, was to reinforce it by adding jumbo craft sticks to the back side before adding the covering. I just used strong packing tape before adhering the final image to the back of the sword. I think a paint stick would also work nicely, but I had these craft sticks on hand already. The raised area was slightly detectable, but made the sword much more durable. 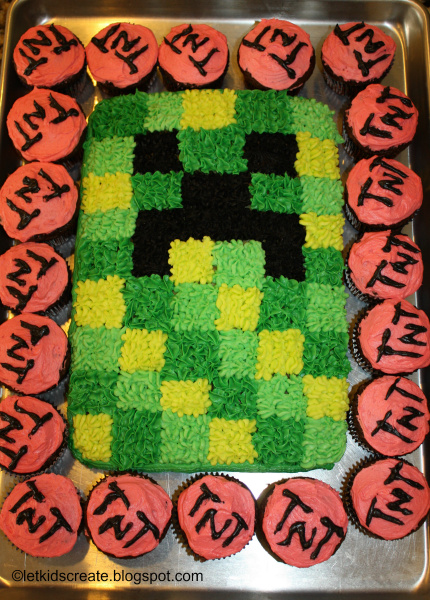 Of course the party wouldn't be complete without a creeper cake. I found this simple idea here. I loved everything about this cake - the shape was a 9X13 rectangle and the decoration on the cupcakes was rather plain and simple. Before I added the frosting to the cake, I took a knife and lightly scored a grid into the cake so I could keep track of the squares easily by doing one shade of the green at a time. Maisy loved it, as did all the party guests. Usually I do my kids' birthday parties at home and we do all the traditional party games and a craft, but this time I went for an uncomplicated and less stressful party and we headed to a trampoline park. I didn't have to worry about games and things to keep the guests entertained, but I have collected a bunch of ideas for going the route over on my Pinterest board. 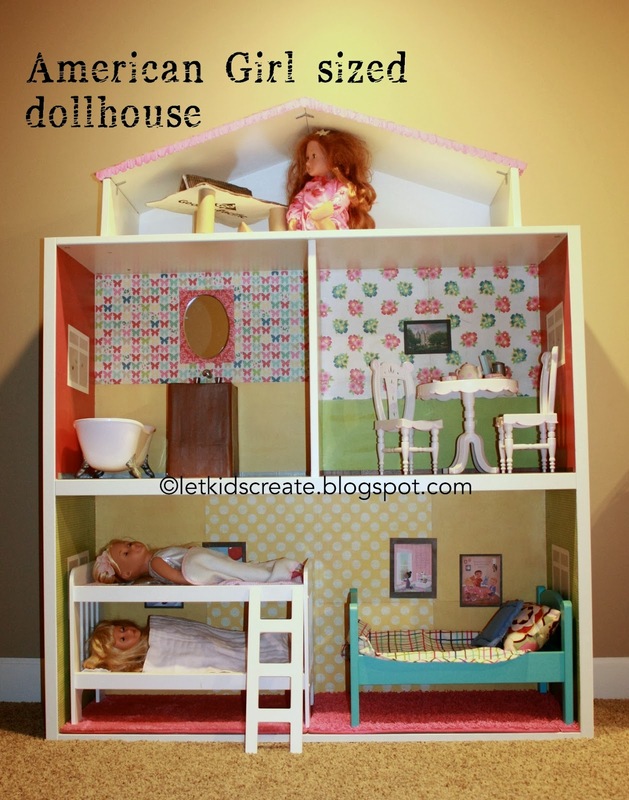 This year for Christmas we surprised our three girls with a giant dollhouse for their 18 inch dolls. I had seen some plans on etsy that you could purchase to build your own, but by the time I had come up with this gift idea I only had about a month to get this done - no time for building from scratch. Then, I came across this idea using the Ikea Besta shelf unit and decided that was simple enough to put together in the short amount of time that I had. The bookshelf itself was super easy to assemble. After assembly, I decided to lay it on its side instead of turning it upright because it would allow for wider rooms, and I would be able to make the entire lower level a shared bedroom since we have so many dolls and beds between my three girls. Because I only used one shelf as a room divider on the upper level, I was left with 5 extra shelves. I decided I could use them to pitch a gable up on top to make a little attic space. 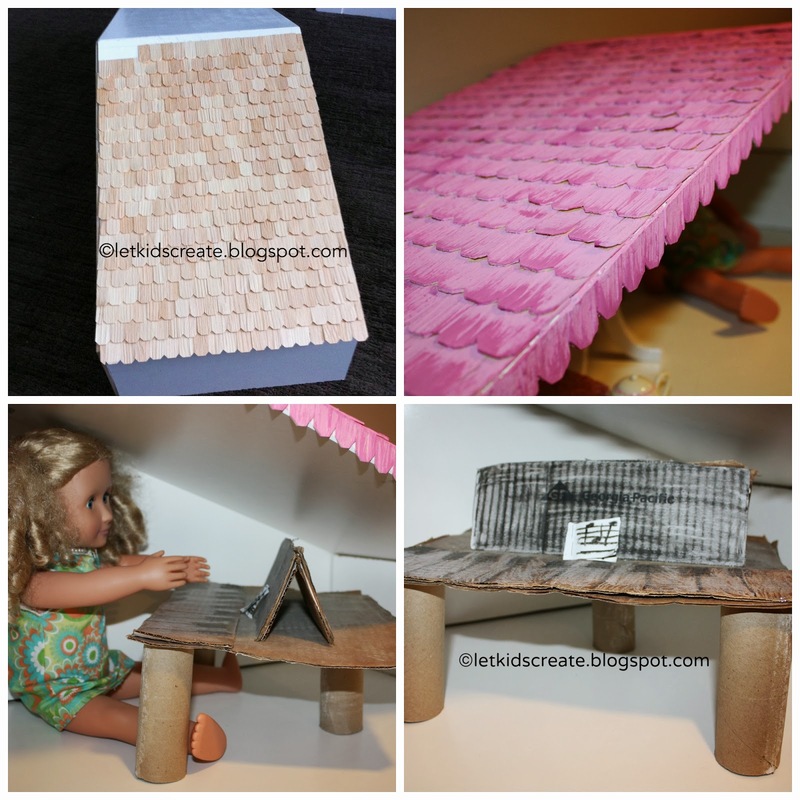 This also gave me the idea to shingle the roof with these dollhouse shingles. Can you believe it took about 1000 of those tiny little shingles to cover that roof? That part took much longer than I expected, but I was super happy with the results. In case your are wondering about furnishings, the white bunk bed on the left side of the bedroom is this Badger Basket brand bunk bed with ladder. The blue bed on the right side is this doll bed from Ikea, which also is wide enough to allow for 2 dolls to lay side by side. The dining table is this set that we purchased from Target a while back. The attic space ended up not being tall enough for a standing doll, but it was tall enough to sit a doll down to play this piano my daughter made last year. She came home from playing at a friend's house with this cute little accessory. She made it out of cardboard and toilet paper rolls. The dolls have had several recitals using this clever little instrument. She even made a doll-sized music book to go with it. I think I had the most fun designing the bathroom area. Inspired by my daughter's cardboard piano, I spotted a cardboard box in my closet that was just the right size for a vanity. I cut a circle on one side of the box to fit a small toy bowl we had lying around. The faucet is a leftover piece of hardware from a towel bar that we no longer needed. We were able to attach it right into the back of the bookcase using that screw that came with it. The knobs are small drawer pulls that I had pulled off an old dresser and no longer needed. I covered the box with scrapbook paper using mod podge, and put another coat of the glue on top to seal it all together. I attached the vanity to the floor with some hot glue. I was also able to find a small mirror at Hobby Lobby and attached it to the wall with hot glue. I framed it in with a contrasting color of scrapbook paper to make it stand out. For the bathroom floor, I bought 3 squares of self-adhesive vinyl tile for less than $1 a piece and cut it to fit. I added a little piece of coving with leftover scraps to hide some of the imperfections I made while gluing the paper on the walls. Before I could attach paper to the walls, I had to rough up all the places where I was going to apply it. This took some extra gritty sandpaper and a lot of muscle to get that shiny laminate dulled down enough to get the paper and flooring to stick to it. 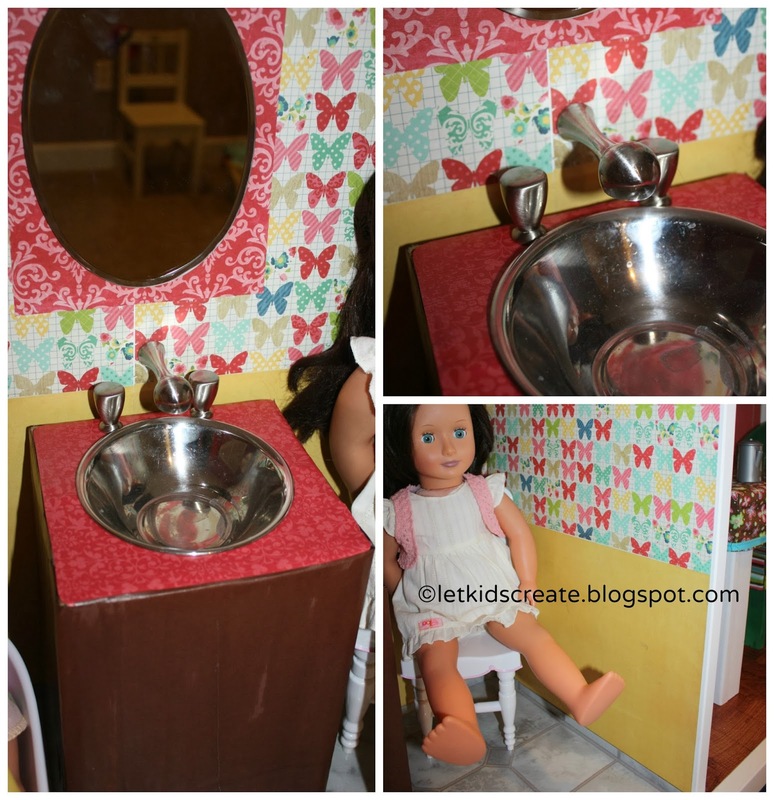 For wallpaper, I used 12 x 12 sheets of scrapbook paper in coordinating prints. I used a layer of mod podge to adhere all the paper. Then I sealed it all with another layer of the glue. In the dining room, I used 3 pieces of hardwood-looking self-adhesive vinyl tile. I really wanted to add windows to the house, but that seemed extremely complicated. I decided for simplicity that instead of cutting out a window, I would use some paper printed with clouds and birds and make a window that way. On the walls, I used a few pictures cut out from magazines and added a paper frame for decoration. The flooring in the bedroom on the lower level is from a carpet sample that a local carpet store no longer needed. After all those late nights and sneaking off to the basement whenever I got a second, their reactions on Christmas morning made it all worth it. I think it will be put to good use for years to come. It's been nearly a year since my 4 year old made these heart butterflies, but they have not been forgotten. Today as Mina and I were planning her upcoming birthday party, she mentioned these butterflies and wants to make them with her friends. Originally, it was Mina's idea to make these when she saw them in our copy of The Heart Book. The idea was contributed by The Iowa Farmers Wife. She loved making them because they involved some of her favorite things: hearts, cutting, pasting, and butterflies. To make these you will need at least 3 colors of construction paper, scissors, a glue stick, markers or crayons, and a pencil. Mina also used a paint pen at the end to add some decoration. I began by drawing out 4 varying sizes of hearts on the construction paper, then I let Mina cut and construct her butterfly. It was fun to watch her follow the example in the book to make her first butterfly, but then style and design her own the second time around. 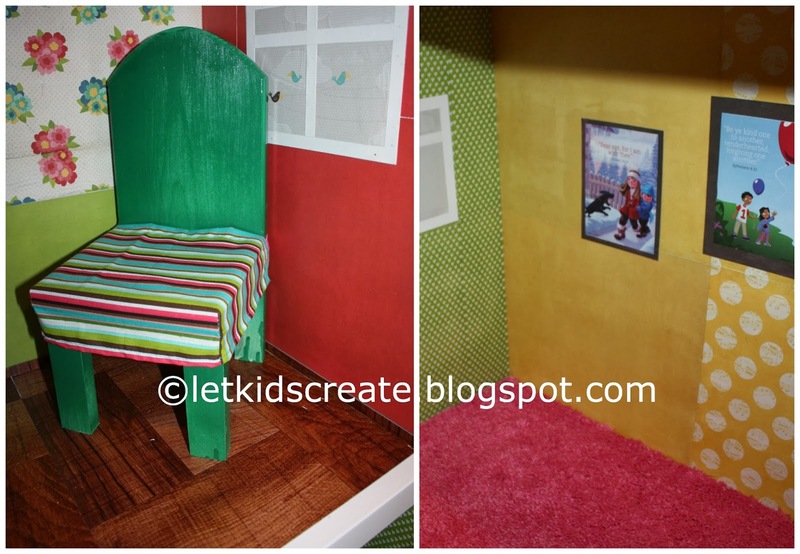 Have you ever had your child do the same art project a year apart? I can't wait to see what she comes up with this time around as a 5 year old! Before I cut out the cardboard shaped, I peeled apart the top layer of my cardboard so the ribbed texture was revealed and ready for stamping. I also glued some old bottle caps to the back of the stars to act as a handle for easier and less messy stamping. You could also just cut another square of cardboard and glue that on the back as a handle. 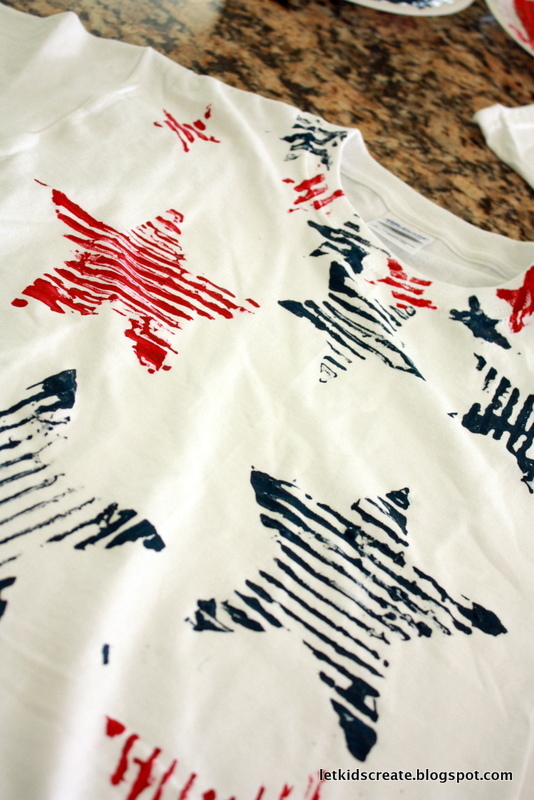 I set out the t-shirts and paint, and my 3 girls got to work, stamping away. My girls are ages 9, 6, and 4 now and they were each able to do this project with ease. We are so set for the 4th now! I just need to take these shirts to the iron and heat-set them after they have dried for at least 24 hours. Just a small post to share what my kids are giving to their school teachers this year as school is coming to an end. 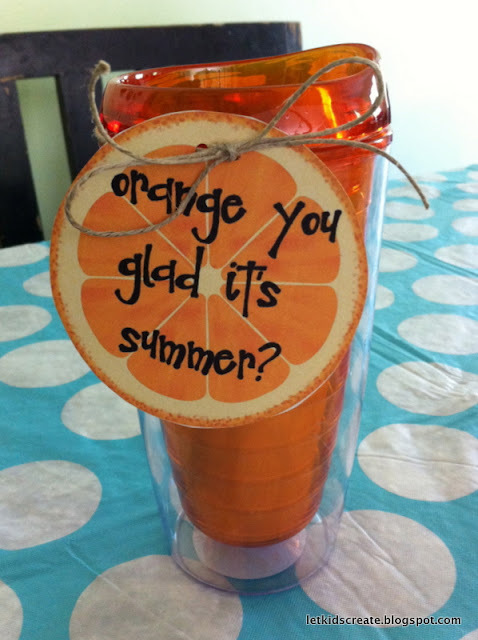 I found this cute "orange you glad it's summer" printable here, found an orange insulated tumbler at the grocery store, and filled it up with a variety of crystal light drink mixes along with a hand-made card from my child. I also wrote a short note to the teacher on the back of the orange tag expressing my appreciation. My kids have been begging me for a long time to do this project again. We did it the first time to make some Halloween decorations, but this time it was a little more of an open-ended project. To begin, lay out your wax paper (or plastic wrap) on a cookie sheet. We used wax paper for this project, but it can be a little tough to peel the final product off. A couple days later, we tried using plastic wrap. The only problem we had was getting all the wrinkles out, but if you can get it smooth I would say that plastic wrap is the way to go. To color the glue, add a few drops of food coloring to your glue and shake or squeeze it around in the bottle to mix it up. 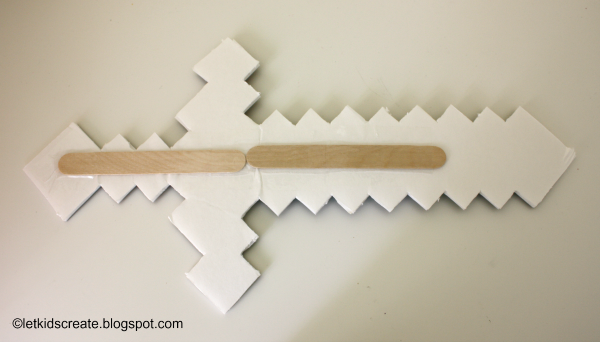 It's ok if it's not completely uniform, the color will gradually blend itself in to the white glue. Maisy started out wanting to use some cookie cutters and fill the shape in with the glue. She was happy with simply filling in the shapes, but once the cookie cutter was removed the edges were smudged a bit. Since the wax paper is translucent, I thought I could place a simple drawing or block letter outline underneath and the girls would be able to trace it and fill it in. The girls preferred this method since it was easier to create exactly what they wanted to. Mina was happy making her "M", but was even more thrilled to make her Mickey Mouse head. Once the art is complete, allow the glue to dry overnight . The top will feel dry in an hour or two, but to be completely dry and ready to peel off, it will take several more hours or even a full day (or two if the glue applied super thick). Lucky for us, it was a sunny day and leaving them outside for a few hours worked wonderfully. Once the glue is completely dry, the figures can be peeled off and strung with a thread and hung on the window, or simply stuck on with some clear tape. It was my turn this past week to host the weekly playgroup that my 4-year-old Mina participates in. 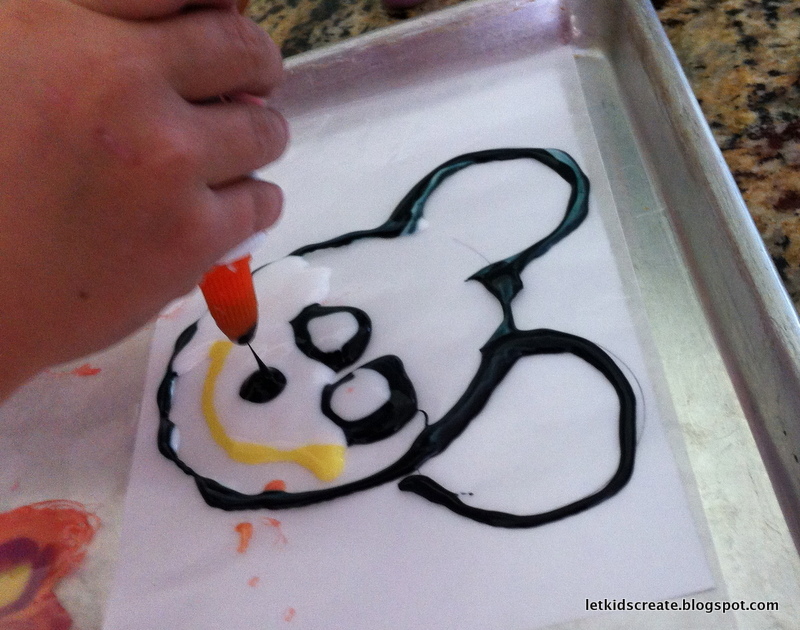 Spring flowers are finally in bloom, so it was the perfect chance to try out this clever art project I saw on Blog Me Mom. I quickly showed the kids how I could get some paint on the back of my fork and stamp it onto my paper to make a tulip shape. I handed them each a fork and a paintbrush (to paint on the stems) and let them have at it. Each child's artwork was completely unique. I loved all the extra color and detail one of the girls decided to give her painting. And in the end, what all 5 girls had really been dying to do was slather their hands in the wet paint. I had to hurry and grab a clean sheet of paper to stamp those handprints onto, or else those beautiful spring paintings would have been destroyed!